The Great Bear Foundation helped kick off the International Wildlife Film Festival (and Earth Week!) in Missoula with WildFest on April 19th, educating the public about bear species and bear safety. As part of our educational table, we set up a variety of specimens including skulls from black bears, grizzly bears, and mountain lions, a black bear skin, and a variety of tracks from mammals in Montana. Many of the kids, and their parents, left with a deeper understanding of bears and other wildlife. A mix of hands-on and passive education, the table helped us provide kids with an interactive display designed to help them learn more about Montana wildlife and the bears that we share habitat with. Additionally, we set up a bobbing for apples station for kids (or their parents) to bob for apples. The station helped raise awareness about our Bears and Apples program, which happens every fall. As part of the program, the Great Bear Foundation helps glean fruit trees around Missoula in an effort to reduce bear attractants in the area and mitigate human-bear conflicts in the region. 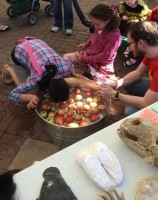 The bobbing for apples station was a real crowd-gatherer at the event, and everyone walked away with a free apple to enjoy. The Great Bear Foundation will be participating in a few more community events this Spring, so keep an eye out for us!